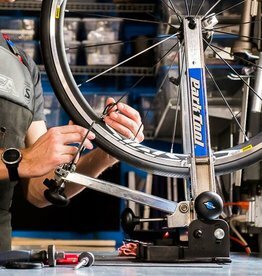 Our Professional Fit is the best, most thorough way to guarantee your comfort and power on the bike. This fit is ideal for road cyclist, mountain bikers, and triathletes. We start by conducting an interview to best understand your riding goals and needs. Your bike's current position is recorded for future reference. Video is taken to analyze your riding posture and style. A thorough cleat fit is the start to all good fits, as we start at the feet and work our way up the body. In some cases your starting position may be far from ideal. If this is the case we transition to our "fit bike" to assist in making quick and easy adjustments to your position. Through a systematic approach we then make the appropriate changes to all your key contact points: the feet, saddle, and hands. Our goal is to maximize power and efficiency while maintaining comfort and stability. We can also use this time to experiment with different crank lengths and a variety of saddles. Once we find your ideal position we record all fit coordinates for future reference. 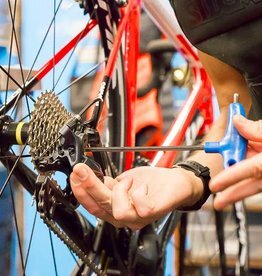 If you purchase a bicycle from us we include a Professional Fit as part of your purchase. We include all necessary follow-up fit work for 3 months after your fit. A triathlon, road, or mountain bike fit takes approximately ~2hrs. Loved my bike fitting! I really enjoyed working with Preston. I took my bike to Tri Town for a fit. Antonio took his time to talk through the process with me. Asked probing questions and got to understand me as an athlete and my goals. I felt that he listened to me and was very thorough. I am incredibly impressed with the expertise and professionalism of Antonio and the Tri Town crew. I cannot recommend them highly enough. Antonio has fit me on 3 different bikes. Each one a little different. Working with him helped alleviate my hip pain while maximizing my power output. He has so many pro-tips and little tweaks to make you comfy and aerodynamic. Regardless of the bike, the fit is what really matters and TriTown does it right.